Take decor cues from two garden-inspired dining destinations. As creative types would know, design inspiration can come from anywhere, be it from the places you shop or the stylish stops you dine at. With plenty of restaurants upping their style game, it’s ever so tempting to cop decor cues from these foodie venues. If you still can’t get enough of the nature-inspired decor, look to The Summerhouse and The Garage for more ideas. 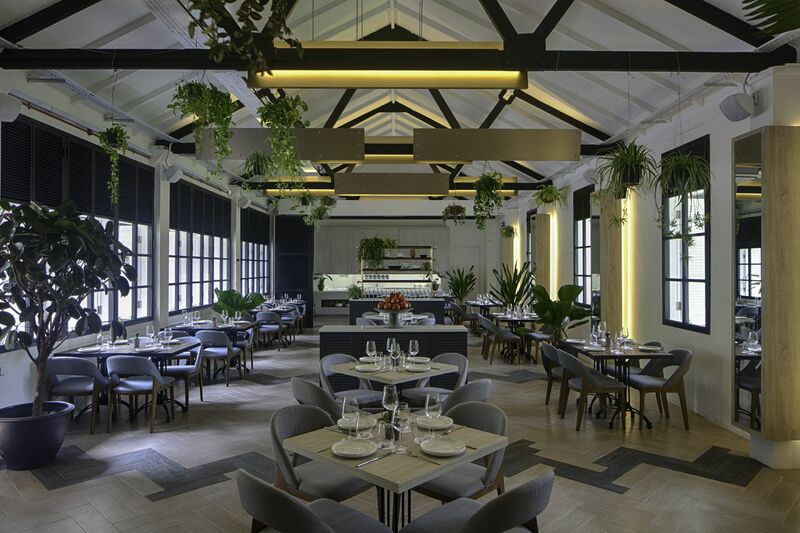 Housed within heritage buildings at the redeveloped Seletar Aerospace Park and the Singapore Botanic Gardens respectively, both dining destinations by 1 Rochester Group embrace the botanical theme cohesively throughout these spaces and on the menus too. “It was essential that we designed The Garage to complement the gardens and to create a unique new venue that has to be welcoming to anyone who goes to the park,” explains Wei Tan, director of Suite Interior Design and the creative mind behind the decor of the two venues. Similarly for The Summerhouse, the designer crafted its interiors around its outdoor garden. Here, he picks out the easy ways to convey such verdant decor within your home. Floral prints and green upholstery are an easy way to introduce the botanical theme to your home. “In Summerhouse, the upholstery used for the dining chairs is a mix of solid green and floral fabrics, to reflect the restaurant’s farm-to-table concept while creating a cosy, homely environment,” explains Tan. You can easily do the same for your living area, by cladding cushions and seating in these garden-inspired prints. Should you find a tropical feature wall too dramatic for your home, try adding just a hint of green to your interiors. Green geometric tiles were added to sections of the walls and flooring of Bee’s Knees at The Garage, to allude to the cafe’s garden theme in a subtle way. “The geometric design of the tiles also allowed me to create a continuous visual flow from cafe’s flooring to its wall,” adds the designer. He opted for green subway tiles for the bar area at Botanico as well, to integrate the fresh shade with its outdoor setting while hinting at the building’s industrial origins. You can always count on nature-derived materials to add that cosy touch to your home. The material palette for the second floor of Botanico at The Garage uses predominantly light wood to add warmth to the restaurant’s monochromatic, industrial-style interiors. Black tiles break up the monotony of the herringbone pattern of its wood flooring, while echo the positioning of the roof trusses. At the Bee’s Knees cafe, the feature wall that sections the cafe is clad in a pebble-like marble mosaic to mimic skipping stones found in ponds and lakes. There are plenty of ways you can bring greenery to your home, even if you don’t have a green thumb—one of which is to pick evergreen plants that are easy to care for. Tan suggests adding small potted plants, such as succulents on side tables, which are low on maintenance while adding that touch of nature to your rooms. At The Garage and Summerhouse, both venues are dotted with plants by the walls or hanging from the ceiling. “We wanted customers to be able to see greenery throughout these spaces, both indoors and outdoors,” explains the designer. For a more striking statement piece, look out for large leafy plants which can take centre stage in any space. Get creative with your terrace areas—these outdoor spaces can create a cosy respite. Draw design cues from the bar area at Botanico at The Garage (seen above), which was converted from a former rooftop garden on the second floor. Tan gave the space a new lease of life, turning the garden into an outdoor deck. Located right next to the elevated gardens (which are maintained by the National Parks Board), the outdoor bar is an intimate spot surrounded by foliage. “We wanted to create a hidden spot that people would not have thought would have been a part of the building,” says Tan.